Carmakers are working hard to make electric vehicles affordable. Ford is offering two incentives for some of its Focus Electric. The last few weeks have seen many price changes in the electric vehicle, EV community with carmakers actively working to reduce the price of their EVs, or making them more affordable. Increasingly as carmakers work out the production issues around new models, especially with a new technology, they are now working on the next step, lowering prices and making them more affordable. Mitsubishi is offering a great leasing program for its i MiEV with as little as $69 a month. All of this is showing the EV segment is dealing with the sticker price problem. Now Ford weighs in with its Focus Electric. Ford Focus Electric Sweet Deal. You now have a few options when considering a Ford Focus Electric. 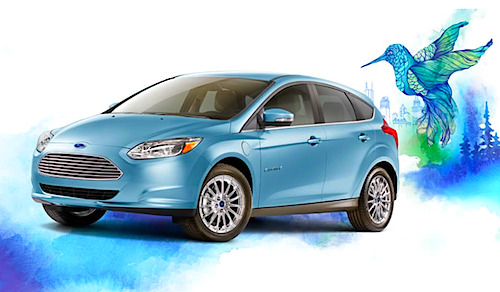 You can either lease the Focus Electric and get up to $10,750 off the cost of the three-year lease with a 36-month period with 10,500 miles per year and $285 per month for $930 down. You can also opt to buy for a $2,000 cash rebate on their website on the original $37,995 Focus Electric, which you can add on top of federal and local incentives. Buyers financing is available through the Ford Motor Credit with a $2,000 cash discount and 1.9% financing. There is a caveat, this does not apply to all Focus Electrics so check the website for more details. Is this a sign of failure? It shouldn’t be. I’ve driven the Ford Focus Electric on several occasions and it is one of the best current electric cars. It felt very tight, well put together and a pleasant drive with good handling. Helping buyers with a $2,000 cash back or creative financing is certainly something we are used with regular gasoline cars. Altogether, the electric vehicle industry is maturing as they become increasingly relevant for city dwellers and urbanites. Offering competitive pricing options and creative leasing systems show carmakers are working hard on making EVs affordable. In the meantime, if you are considering a Ford Focus Electric between now and April, 1, yes, don’t laugh, now is the time.